A lack of proper nutrition in the earth can deprive an oak of chlorophyll, causing the leaves to abandon their healthy green color for a premature yellow. But a far more dangerous disorder, caused by an easily transmittable fungus, also results in the yellowing of leaves, often to the point of death. A new oak tree with leaves that are turning yellow could simply be situated in soil that contains a high level of alkalinity. This disorder is commonly known as iron chlorosis and is the result of too little iron being available to meet the nutritional needs of the oak. The result is leaves that are unable to properly conduct photosynthesis, the process that converts sunlight into available energy for the tree. A clear indication of chlorosis is the presence of yellow leaves with veins that remain green. Iron chlorosis appears first on newer foliage near the tips of branches. The leaves typically grow smaller than they normally would, then begin to curl, dry and fall prematurely from the tree. This situation can be rectified by adding appropriate fertilizer containing iron chelate, iron sulfate, ammonium sulfate and sulfur to the soil. This affliction is typically not lethal unless it persists for several years without treatment. Chlorosis can also be caused by overwatering the oak. A much more dangerous condition that can cause a yellowing of oak leaves is the fungal disease oak wilt, brought on by the pathogen Ceratocystis fagacearum. This disorder is nearly always fatal and normally causes the oak tree to die within one year. Occasionally, a tree survives as long as two years. However, trees belonging to the white oak group are often resistant to oak wilt. The fungus spreads easily through the root systems of trees that are intertwined and also is transmitted by animals jumping from tree to tree. Mechanical devices like pruning shears regularly contribute to the spread of oak wilt and these should be sterilized to prevent the possibility of the disease being transferred to other plants. A tree suffering from oak wilt should be removed from the area and destroyed. 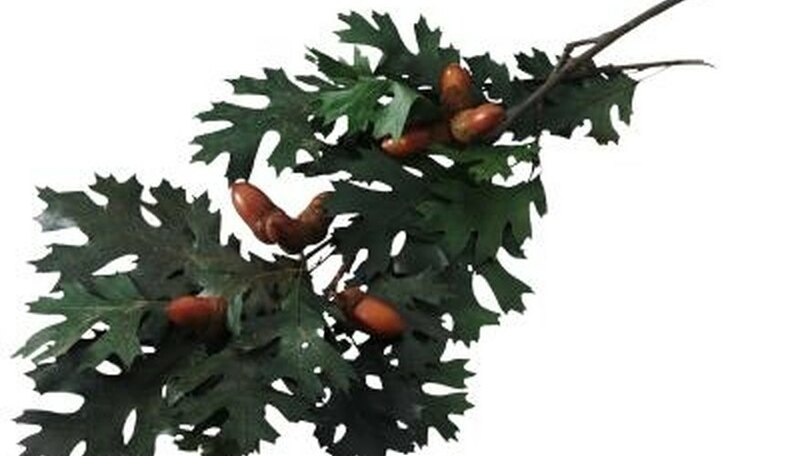 Insects can also cause the leaves of an oak to prematurely yellow. Various wasps build structures known as leaf galls on the foliage of an oak. These structures are rarely fatal to the tree but their presence can drain vigor from the foliage.